In the 1970s, newly-discovered pictures of “Victorian waifs” were a hit with both historians and art collectors. The chemistry seemed right. The context . . . not so much. But people only learned that too late. In 1974, the work of Francis Hetling delighted the academic world. Hetling was a diarist and amateur photographer. He’d toured London taking photographs of Victorian orphans in Barnardo homes — homes set up in the 1870s by a philanthropic doctor, Thomas Barnardo. Although poor children were fashionable subjects for photographs, the Victorians liked their waif tableaux staged. Well-to-do children were given fake rags and often put in rural settings. Seeing what actual poor children looked like was an opportunity. Of course, experts checked it out. The “photographs” were actually “calotypes,” or “talbotypes.” This added to the plausibility of the story. These types of images were an innovation in photographic technology. People had known for hundreds of years that certain preparations of silver would discolor when exposed to the light, and that this could be combined with a camera obscura to create images. The problem was making the images dark enough, detailed enough, and permanent enough. 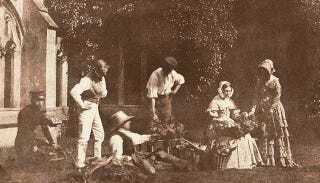 Many photographic methods in the 1870s required that people stayed put for up to an hour at a time, and some required heavy and delicate glass plates. Calotypes shorted the process to a couple of minutes, and required a sheet of prepared paper. Essentially, the piece of paper would be prepared with potassium iodide and silver nitrate — both light sensitive — and then stored for as long as the photographer liked. At the last minute, before the photograph was taken, it got washed in a solution of more silver nitrate and gallic acid. It could be exposed for as little as ten seconds, but usually more like a minute or two, depending on the light. The paper had no visible image on it. It was only later, by repeatedly washing it with more silver nitrate and gallic acid that a negative became visible. Once the photographer fixed the negative, they could then press this negative against a paper that had more traditional chemicals in it, and expose the image for as long as they liked. The final image would have at least traces of the chemicals used in the calotype process in it. The Hetling images did, although investigators could not be absolutely certain. So it wasn’t the chemistry that caught “Francis Hetling.” It was a man who recognized the eleven-year-old daughter of a guy he knew. The girl turned out to have had her picture taken by Howard Grey, and man who worked in advertising and knew that nostalgia sold well. He staged pictures of Victorian waifs, and then gave them to Graham Ovendon, an artist who knew how to fake a photograph. The two weren’t exposed until 1978. Looking back on the disaster, some art critics have found fault with one particular photo. We can see that it’s a poignant photo, and one that casts doubt as to the ethics of the photographer. A child in rags throws her hand in front of her face, ashamed to have her picture taken. But poor children of that time wouldn’t have had a concept of the notoriety or permanence that photographs could bring. More importantly, with the benefit of hindsight, it’s easy to see that there is too much motion in the photograph for it to have been taken at the time. It appears to be a quick, improvised gesture. The girl would have had to have frozen in that position for at least ten seconds, and possibly more like a minute or two, given the low light around her. Grey and Ovendon were tried for fraud in 1980, but not convicted. The photographs, some of which had hung in the National Portrait Gallery, were taken down.